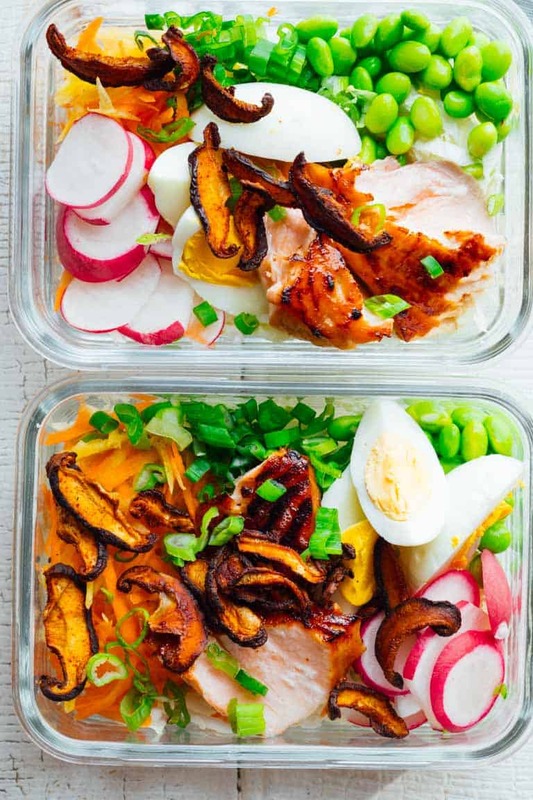 These Meal Prep Wasabi Glazed Salmon Power Salads are high protein, gluten-free and totally satisfying for a week of healthy lunches. May is Salad Month here on Healthy Seasonal Recipes. This is my fifth year of posting salads all month long. You can browse through the Salad Month recipes I have shared here. This Wasabi Glazed Salmon Power Salad is the latest in the series! 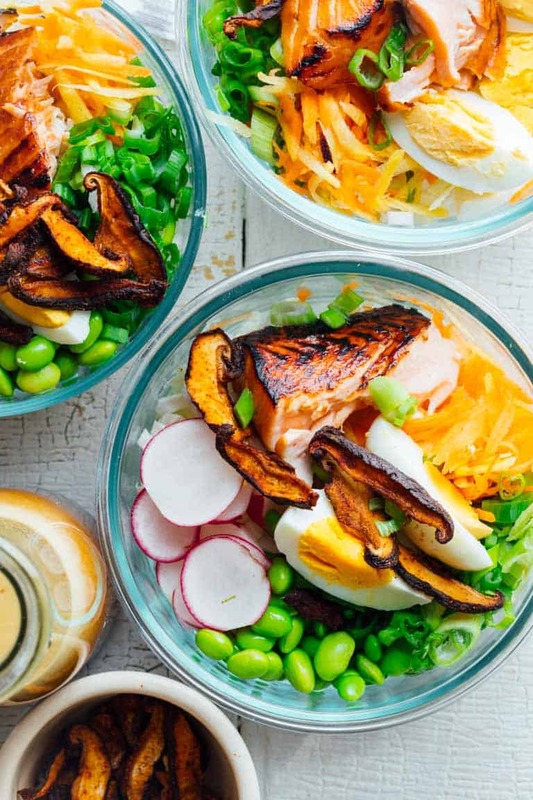 These Wasabi Glazed Salmon Power Salads have edamame and hard boiled eggs and my favorite sesame dressing but my ginger carrot dressing would also be great with it. The crunchy shiitake bacon mushrooms goes well with the Asian flavors in this big salad. I also added in plenty of seasonal veggies, including Napa cabbage, radishes , which are rolling in right now, and shredded carrots. All of which they go so well with these other flavors. The Wasabi Glazed Salmon is really easy to make and super flavorful. 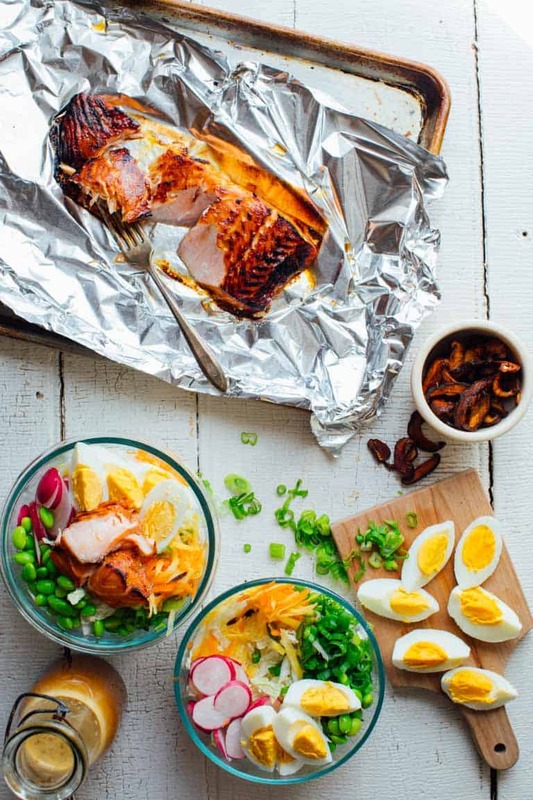 Just combine maple syrup, tamari and wasabi in a ziplock bag and add the salmon. If you’ve never bought wasabi powder before, it is sold in small jars in the Japanese and/or Asian section of good grocery stores and specialty food stores. I love the way it tastes with fish but it’s also great in mashed potatoes! Salmon is packed full of omega 3 fatty acids which fight against inflammation and protect your heart. Vegetables, especially beans and greens, are loaded with fiber. Fiber helps feed your gut, regulate your blood sugar and digest the nutrients in your food. Edamame is a tasty legume that has 17 grams of protein and 8 grams of fiber per 1 cup serving. The yolk of an egg contains all the vitamins and minerals found in that egg, just like the germ of a seed. Egg yolks are a good sources of several nutrients including vitamin D, vitamin B12 and folate. Bonus: their protein and fat keeps you more full for longer! One more thing, before I get to the recipe. 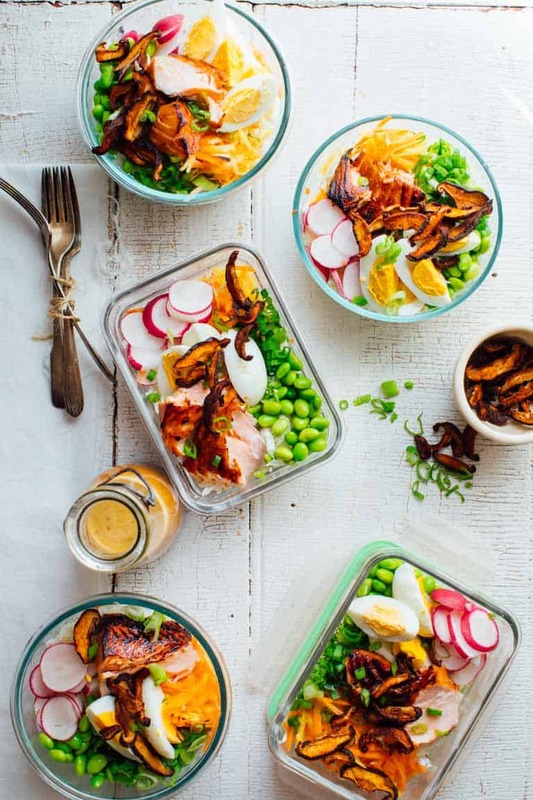 If you’re looking for more help with meal planning, check out this Custom Meal Planning Service Karman is offering. She is a Registered Dietitian, and will email you everything you need! How cool is that?!! Combine maple syrup, tamari and wasabi in a large re-sealable bag. Add salmon and refrigerate 30 minutes. Arrange oven rack in upper third of the oven. Turn broiler to high. Line a rimmed baking sheet with aluminum foil. Remove salmon from the marinade and set on the foil. Broil salmon until just barely cooked through, 5 to 8 minutes. Cool and flake salmon. Meanwhile, Arrange cabbage on five large re-sealable containers, dividing evenly. 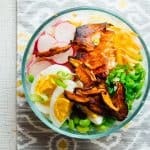 Top with edamame, radishes, scallion, carrots and eggs, dividing evenly. Cover salads and refrigerate up to 4 days. Keep shiitake bacon separate for the crispiest texture. Dressing can be packed into small jars. Tip* To hard boil eggs: Place eggs in the bottom of a small saucepan. Cover generously with cold water. Set over high heat and bring to a simmer. Reduce heat to maintain a gentle boil and cook for 9 minutes. Remove from the heat and run cold water into the pot continuously for 3 minutes. Drain and peel the eggs. I already prepared a salad for this recipe. It turned out a very tasty, satisfying and unusual salad. My whole family said it was a very tasty dish! Thanks for the step-by-step recipe! SO glad you like it! Happy cooking! I’m psyched to hear you like the recipe Jo. Thanks for stopping by to say so. Thanks Dawn. I am glad you like it. I appreciate the compliment, and I’m glad you stopped by. Happy cooking! Thank you very much Swati. Have a great day. I love salmon but have n ever tried wasabi – is it very spicy? 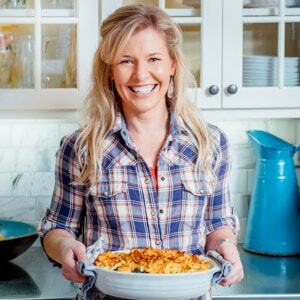 Following you on Pinterest now and can’t wait to see what recipe you share next! This meal prep looks so healthy and delicious. I love how this salmon looks like. Definitely a keeper. Oh God, its color looks wonderful. No doubt about nutrion of salmon, and wasabi is the best choice to combinate with salmon. Thank for your sharing! 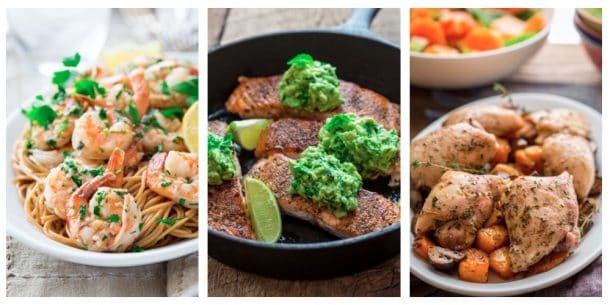 This is an awesome recipe to use for meal prep. I looove salmon on my salads and the flavors in this sound incredible! Oooh, that salmon sounds phenomenal! 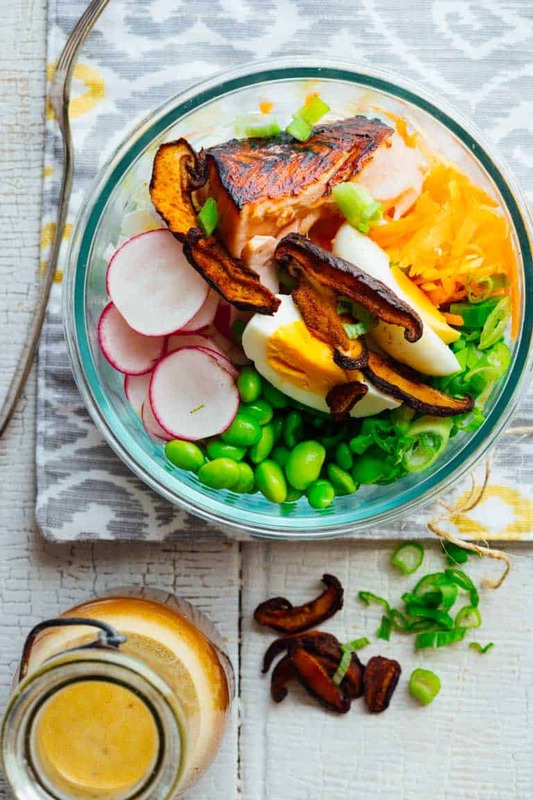 Perfect protein for this beautiful power bowl! I love getting my protein at lunch! Thanks a lot Liz. This is lunch meal prep for the win! Looks so delicious! Meal prep makes such a huge difference. I love being able to just grab it from the fridge and it’s ready to go! I think the only thing here that I’m a bit leary about is the wasabi powder. I’ve not had wasabi in any form to this point without feeling like I need a gallon of water to wash it down. I’m not a heat / spice kinda gal. Otherwise, this is delicious! Oops, forgot to rate…you changed your rating system so it’s in the comments now. Hooray! If you are considering making this salad – DO! Made it tonight and just served it for dinner. Salmon is sweet with a hint of wasabi heat and salad is crunchy and full of texture. I practically drank the sesame dressing at the bottom of the bowl at the end! I forgot to buy edamame so subbed thawed peas and it was delish. My ten year old is asking for this salad again already! I love it when my kids are into the yummy healthy food I like. You rock for coming back to rate my friend. Thank you!